Airtel 4G is really rocking now though their network is yet to cover everywhere, base on the report that they will make the network available in all states and cities but currently we only have 3 stabled states which are Ibadan, Abuja and River state. Ever since Airtel has launched their 4G network they have been looking for strategy to capture users mind and they've really succeeded by giving 3 free bonus at a go. 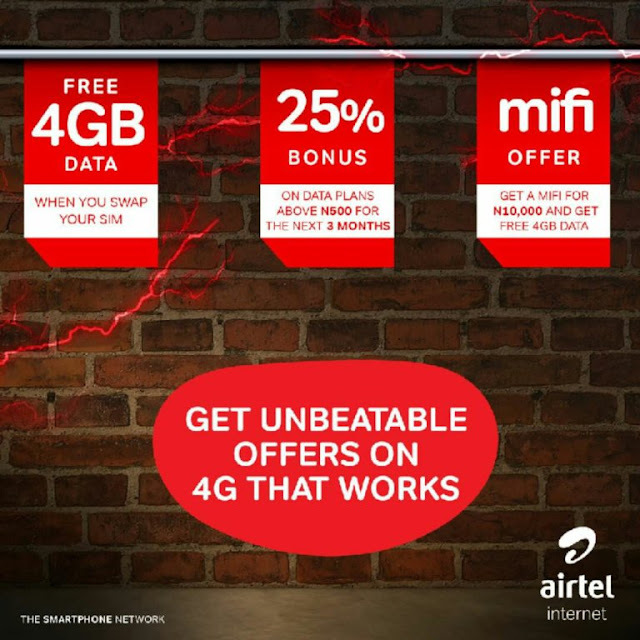 Airtel gives free 4GB data when you swap your SIM, 25% bonus on data plans above N500 for the next 3 month , and also MiFi bonus (get a MiFi for N10,000 and free 4GB data. it's painful that not everyone can enjoy this package due to network coverage but will be of great achievement if Airtel 4G can be made available through the Nigeria. Free 4GB data valid for complete 30 days. You can get 4G network at any nearest Airtel office if you have coverage in your location. This is real and still very much available until they decide to stop the offer, if you want to swap an old SIM then visit any nearest Airtel store as said earlier or you get new 4G SIM from any outlet. After that make sure you register the SIM and switch on your 4G network, so amazing and working like magic, get yours today.